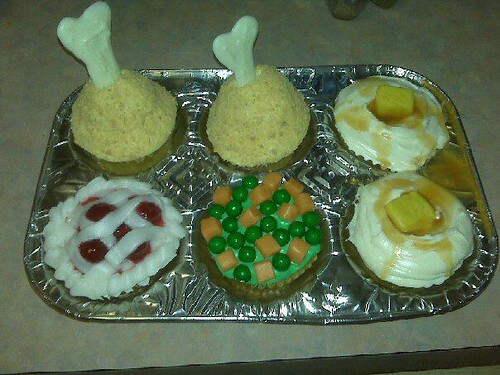 By cupcakeSerenity on August 21st, 2012 . Filed under: Bakeries, Cupcake Ideas, Photos . I think I just figured out how to get my kids to eat their peas and carrots. Who needs a turkey dinner with all the fixin’s when she could just have this kind of turkey dinner? Complete with buttery mashed potatoes and cherry pie! So clever! These cupcakes were created by Sir Ritz Creations of Cedarhurst, New York. This photo is a recent addition to Flickr, but I’m going to store it away for use on turkey day. November will be here soon enough.